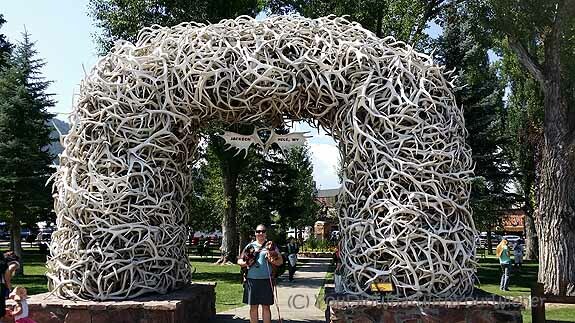 Last month we took a road trip to Jackson, Wyoming. I didn’t get a lot of photos of Chester and Gretel because 1) we were in areas where they weren’t allowed to see the sights (Yellowstone) and 2) internet was spotty or non-existent so I took the opportunity to unplug from technology (it was nice). I did post some pictures of our travels on our Facebook page. If you don’t follow us there, I suggest you do. I share a lot of adventure pictures there that never make it to the blog. You can also check out Chester and Gretel at home living the good life. 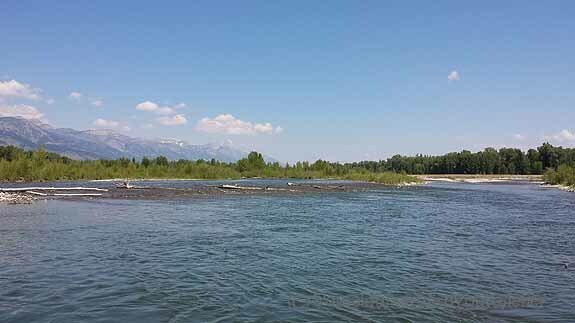 While we were in Jackson, our friends took us for a rafting trip on the Snake River. It’s was mostly a float trip but there were some areas of bouncy rapids. This was Chester and Gretel’s first time on a raft. 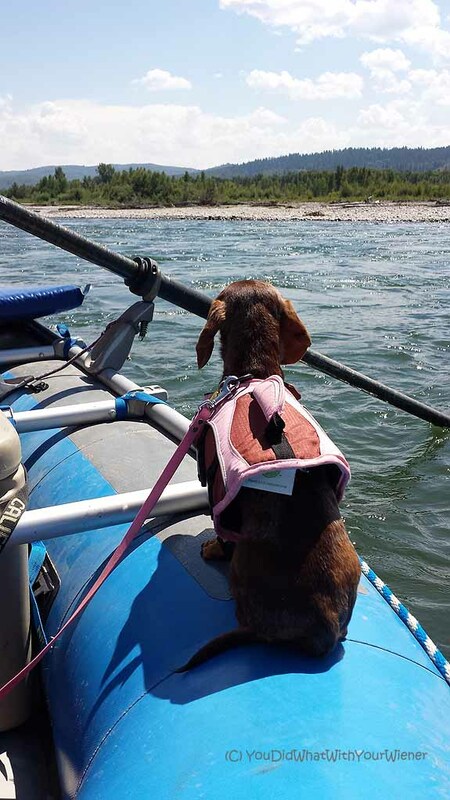 They enjoyed it – mostly sitting on the edges of the raft to see where we were going and to watch birds (Gretel). Great photos. The scenery looks amazing. Chester and Gretel look like they had a great time. That photo of Gretel is so precious! Great pics. Certainly tired them out. Gretel does look very cute. My guys would be looking for any possible way to get off the insanity of being on the water and safe back on shore. Who knows though, they might surprise me. Good for you for getting them out and riding on rafts. Very impressive. Looks like you all had a great time! 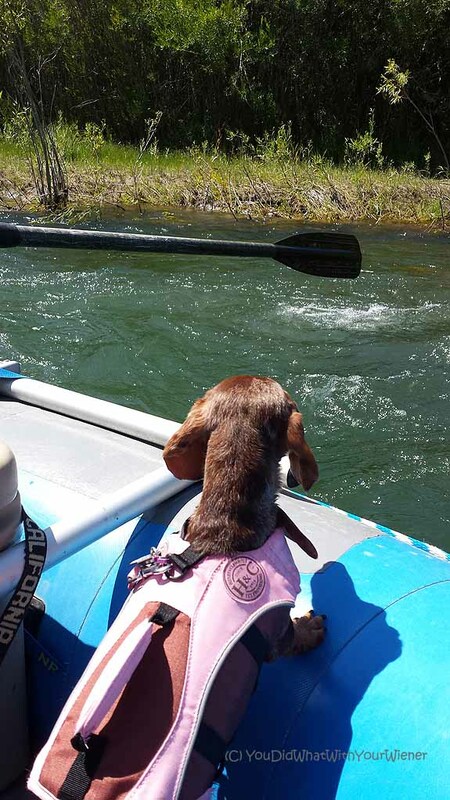 Love your little paddle-pups! Looks like you had a wonderful trip. 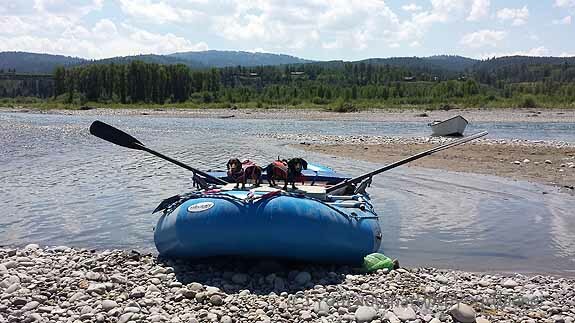 Glad Chester and Gretel enjoyed rafting. I may be biased but I think boats and dogs are meant to go together. 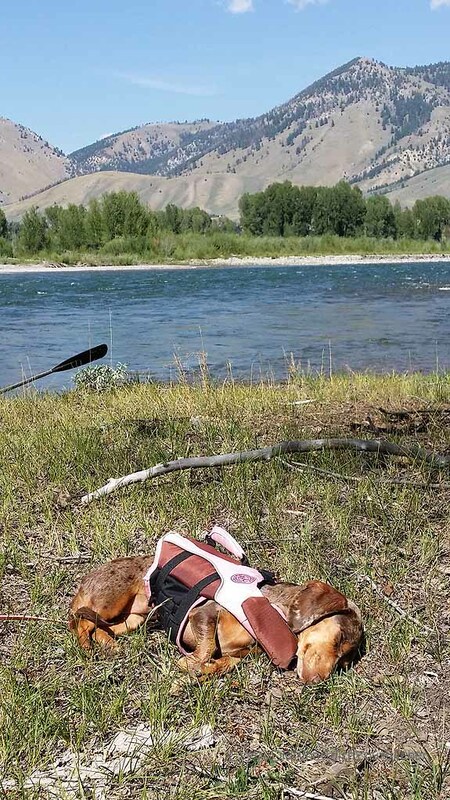 Lucky dogs having such a great dog mom taking them on adventures! We arrived back in Jackson yesterday. I can’t believe you were here in the little window, we weren’t. Bummer. The Snake is beautiful, and how fun you got to take them down the river. Awwww, Gretel…. You’re so sweet sleeping in the grass with all your gear on. Whenever I work hard or play hard, I sleep all the way home in the car! That last photo, crashed out in the sun is so sweet! Looks like a fun adventure! Beautiful scenery and I love how they were enjoying themselves! What a fun, relaxing adventure! 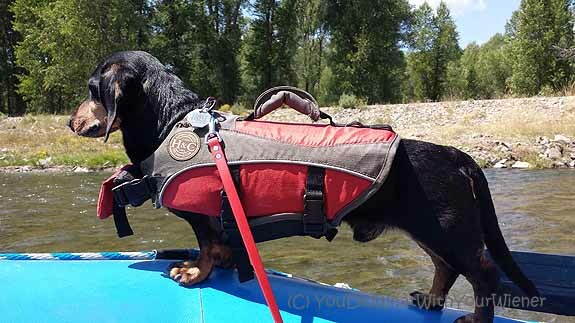 I’ve taken my dog Milo on float trips now 2 summers in a row. He really doesn’t care much for the water, but does seem to enjoy being with people in the raft all day. He absolutely hated the kayak…flipping us over at one point, getting scared and trapped on the other side of some brush. When he finally found a way back to me he decided enough was enough and he wanted to go home. Then he started running in the direction of home…upriver. And would not come back when I called. After following him for 15 minutes I finally caught up with him. I was quite worried for a few minutes though since we had been on the river for a few hours at that point. 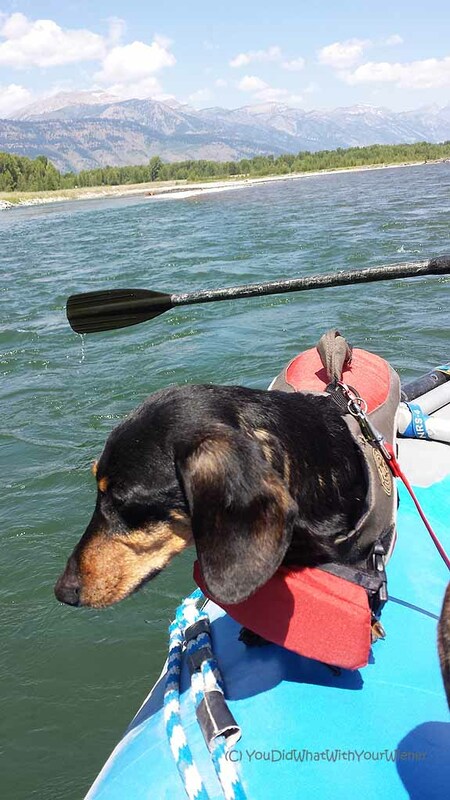 I will never again make him get in a kayak. Mi Melody. When we visited the park, we just spent a few hours driving through. It was hot so we couldn’t leave the dogs alone in the car for more than a minute or two. If seeing the park had been the goal of our trip, we would have left them at home or left them with a dog sitter for the day. Instead, we had this crazy system where I would get out of the car and sightsee while my hubby stayed with the dogs. Then we would switch. It was so crowded there the parking lots were often full. It worked out fine in the long run because he could drive around for a little bit taking pictures until I was done.